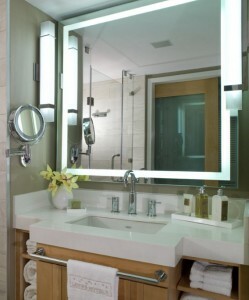 Bring some new life into your basement bathroom this spring just before summer starts. You can have bathrooms on almost any level of your home. Although it might sound unconventional, you can even have a bathroom in your basement. However, just because it is on the lowest level of your home, that doesn’t mean it needs to fall victim to neglect. Bring some new life into your basement bathroom this spring just before summer starts. Any home improvement project will have a set budget. While you can find innovative ways to stretch this budget as far as it will go, you can’t overspend. Exceeding your budget might not seem possible when you want to give your basement bathroom a facelift, but you would be surprised, especially if you are looking for a dramatic remodel to alter the feeling of the room. Do your research and narrow down what you want to incorporate into your newly redesigned bathroom before you begin the work. Next, do whatever you can to make the most of your available space. Chances are, the basement bathroom might not even be a full bath, depending on the size of your home. Wider mirrors can capture and reflect more light. You can also think about using a frameless shower door. Sometimes, a double vanity might be a better idea than just a single vanity – two sinks are better than one, especially if you have the room for it. Paint everything a brighter color, even if that wasn’t your original idea for decorating the bathroom in your basement. The third step in remodeling your basement bathroom is to consider what new hardware and fixtures you would like to install. Whether you would like to add a new bathtub, switch to a shower stall, put in a brand new medicine cabinet, or replace the knobs or pull handles on the cabinets, that is ultimately up to you. Your decision hinges on the theme for your new bathroom, because you will want to be sure that it is soothing, and that it all ties together. The theme you had six years ago is probably different than the one you had six months ago. If it is, then how long has it been since you last refreshed your basement bathroom? Think about what you’d like to see in six weeks’ time when you are choosing your new theme. While it might not be complete yet, it’ll give you an idea of a goal to reach. This entry was posted on Thursday, May 31st, 2018 at 9:05 am. Both comments and pings are currently closed.